The Master and Apprentice. Just a couple of guys who believe the answers to the universe begin and end at Steak 'n Shake. in 2017, Russell Athletic, the long-time official uniform provider of the Little League World Series, set to thank the coaches who make the game possible. Along the way, we discovered something important – when they aren't teaching kids to get in front of grounders or choke up on the bat, these coaches play a different role. Over 85% of youth baseball and softball coaches are parents with kids on the team. We highlighted this parent/coach relationship with a special film for Father's Day. Everyone has a bad roommate story. After living with the Big 10 mascots, Sasquatch has many, many bad roommate stories. We shot eight ads in a single day for this partnership between Jack Link's Snacks and the Big 10 Network. If you're thinking of doing something similar in an non-air conditioned dorm outside Chicago in July, bring plenty of ice packs for the mascots. 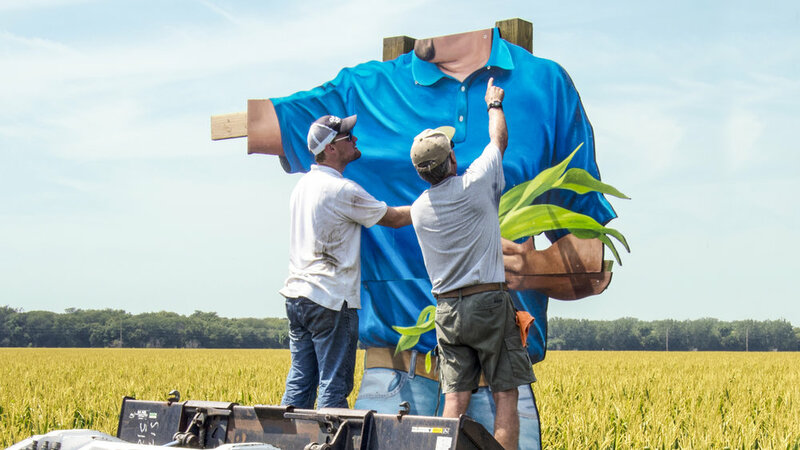 "This delightfully ridiculous campaign... snuck onto the national stage." In 2017, every city in North America scrambled to answer one simple question - where should Amazon build their new 5 billion dollar headquarters? As a modest midwestern city without the resources of it’s flashy coastal competitors, Kansas City needed to stand out from the pack. We set out to hack the thing Amazon holds most dear – their coveted and highly-protected product review system. All we needed to do it was a charismatic mayor, an order for 1,000 items, and many, many reviews. After it was all said and done, we'd collected over 1,600 media stories, 150 million earned impressions, over $2 million dollars in earned media value, a One Show appearance, and two Cannes Lions. Russell Athletic set out to rid the world of underwear funk with their new odor-fighting FreshForce Underwear. We tested it in the stinkiest, sweatiest, furriest place of all – becoming the official underwear of Minor League Baseball mascots. Funk Relief Nights at ballparks around the country, in-depth documentaries, and relief kits for every Minor League mascot in America brought the idea to life. "I'd say it's probably one hundred and fifty degrees in Chico's underpants and I don't even want to think about it." Dog owners, and especially Subaru-loving dog owners, should eat this right up. A television ad developed for the introduction shows a Harley owner lavishly cleaning, buffing and shining his bike; in the ad’s punchline, he slaps a For Sale sign on it and walks away. After riding the new Indian, I get it. After originally ceasing operations in 1953, relaunching Indian Motorcycle was a massive task. My team spent two years working to reintroduce the brand and launch the first completely new bike in more than 50 years. We leaned into an insight about motorcycle riders - though they valued riding an American-made bike many bristled at the fact that there was literally one choice available on the market. Which is to say, there was no choice at all. We set out to change that. Here’s to supporting moms and babies from the start. 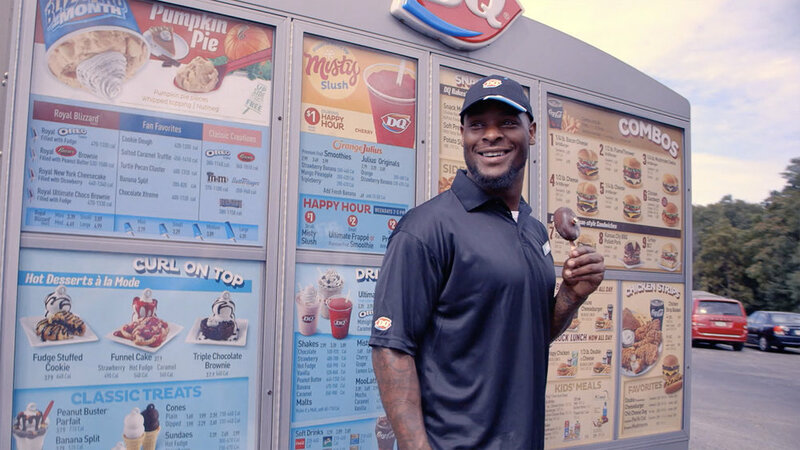 Locked in a contentious contract dispute in the summer of 2017, Pittsburgh running back Le'Veon Bell took to Snapchat and Twitter to fill out a job application at a local DQ store. We sprang into action and invited Le'Veon for a tryout. A few days later, he was back in the store making treats for fans and living his DQ dream. The opportunistic campaign earned 205 million earned impressions and and a 991% increase in brand mentions. On top of that, Le'Veon got his new contract. 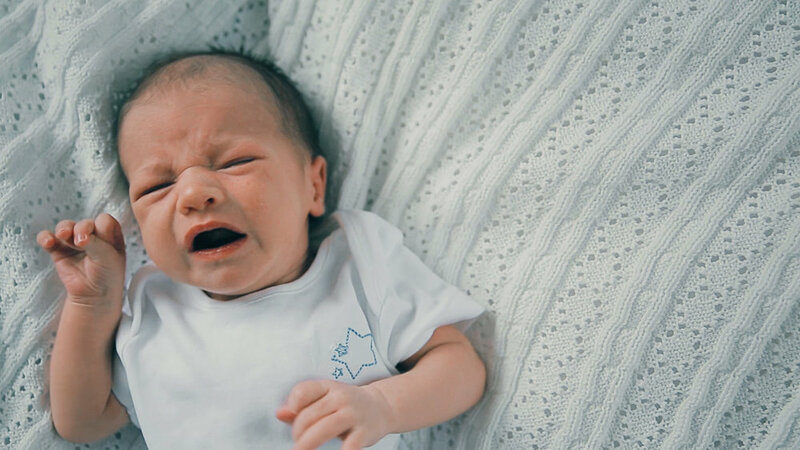 We're all wired to want to make a baby's cry stop. But a cry can be a very powerful and hopeful thing. We helped March of Dimes turned the donated cries of real babies into comfort with the world’s first Lullacry. Went from dominating Sundays to dominating Sundaes. A world-class gift to celebrate a milestone ten-year agency/client relationship. We created a classic executive oil portrait of the world's most unlikely executive. In 2017, every city in North America scrambled to answer one simple question - where should Amazon build their new 5 billion dollar headquarters? As a modest midwestern city without the resources of it’s flashy coastal competitors, Kansas City needed to stand out from the pack. We hacked the thing Amazon holds most dear – their coveted and highly-protected product review system. All we needed to do it was a charismatic mayor, an order for 1,000 items, and many, many reviews. After it was all said and done, we'd collected over 1,600 media stories, 150 million earned impressions, and over $2 million dollars in earned media value. 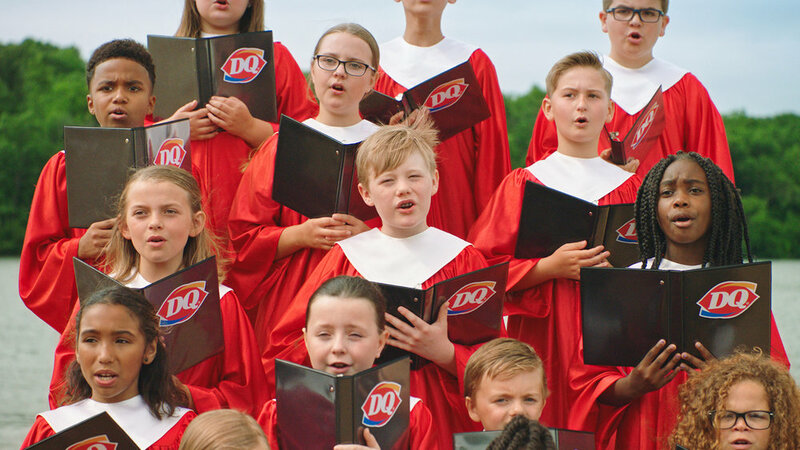 Every year on Miracle Treat Day, each Blizzard that DQ sells helps kids in Children's Miracle Network Hospitals get back to being kids. On Puppy Bowl Sunday, we created the biggest mess on the internet with eight rescue puppies and one pristine white room in a live two-hour streaming event. And we did it for a great cause: raising money and awareness for the BISSELL Pet Foundation and all they do for animals in need. In this socially driven campaign, every use of our hashtag triggered a donation and got us closer to unlocking another mess for the puppies to enjoy. 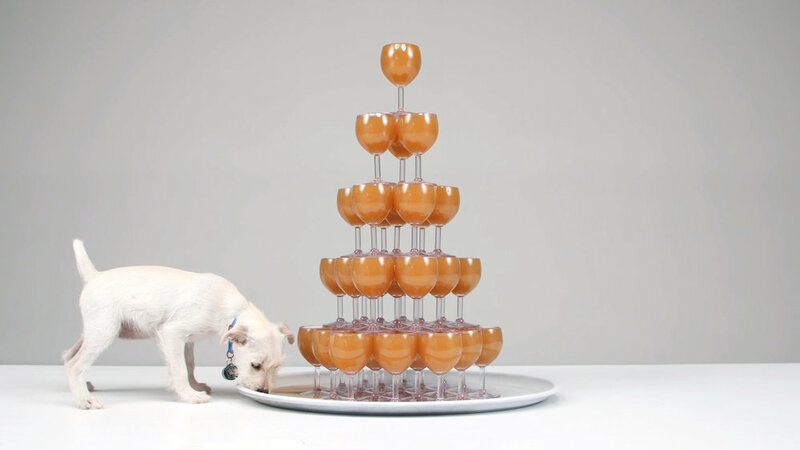 Working with a veterinarian we created twelve delicious, puppy-safe messes included dozens of peanut butter-coated tennis balls, massive plates of spaghetti drenched in 30 gallons of sauce with softball-sized meatballs, a three-tiered cake frosted in mashed potatoes, and a champagne glass tower filled with gravy. It's the picture of dignity, too, except for the fact that Bigfoot is still badly in need of a haircut. Matt Pruett lives, works, and makes things in Kansas City. He has a BFA in Visual Communication from Kansas State University and attended Miami Ad School where he studied art direction. Matt has been an instructor at Miami Ad School and served as a mentor for the School of Journalism and Mass Communication at the University of Minnesota. His work has been recognized by Cannes Lions, One Show, D&AD, Clio Awards, Communication Arts, Adweek, Advertising Age, and others. To celebrate the biggest movie of the summer, we sent a one thousand very lucky DQ fans on an adventure of their own in partnership with Guardians of the Galaxy 2. Their mission? Find the last cassette player in the galaxy and listen to our mixtape filled with exclusive soft-serve-inspired tracks to discover what amazing prize they won.